We’re zipline aficionados. We love ziplining. We are all about Oahu ziplines. We have ziplined on courses all over the Hawaiian Islands, on the US mainland, and internationally. 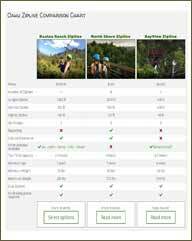 OahuZipline.com is all about safe fun. We like ziplining because we get an adrenaline rush, see beautiful sights and enjoy our friends with an activity that is statistically very safe. Our team is made up of people mostly in their 20s and 30s who love to travel and play. Some have kids who are becoming zipline aficionados. We hope that you will enjoy the benefits of our experience and our enthusiasm. Oahu is our home so we couldn’t help but review the ziplines in our backyard. Of course, you can get reviews from TripAdvisor or Yelp—and we recommend that you do. These types of reviews can give you an overall feeling for a company. The difference between those reviews and an expert’s is experience. For example, you might be looking for authentic Mexican food in Honolulu and find a restaurant with great reviews on Yelp. What you don’t know is that most of the reviewers have never been to Mexico or worked in a true Mexican restaurant. Therefore, they lack the experience to comment on the authenticity and quality of a restaurant. The same is true with ziplines. We have the experience, and we’re happy to help you choose the best zipline for you. If you have more questions about Oahu Ziplines, please contact us.